The first international match played by a Soviet team came in September 1922, when the Finnish Workers' Sports Federation football team toured Russia. The Soviet XI scored a 4–1 victory over the Finns in Petrograd. This was also the first international contact for Soviet sports after the 1917 October Revolution. In May 1923, the Soviet team visited Finland and beat the Finnish squad 5–0. The first match against national team was played in August 1923, nine months after the establishment of the Soviet Union, when a Russian SFSR team beat Sweden 2–1 in Stockholm. The first formally recognised match played by the Soviet Union took place a year later, a 3–0 win over Turkey. This and a return match in Ankara were the only officially recognised international matches played by the Soviet Union prior to the 1952 Summer Olympics, though several unofficial friendlies against Turkey took place in the 1930s. The 1952 Olympics was the first competitive tournament entered by the Soviet Union. In the preliminary round, Bulgaria were defeated 2–1, earning a first round tie against Yugoslavia. Before the match, both Tito and Stalin sent telegrams to their national teams, which showed just how important it was for the two head of states. Yugoslavia led 5–1, but a Soviet comeback in the last 15 minutes resulted in a 5–5 draw. The match was replayed, Yugoslavia winning 3–1. The defeat to the archrivals hit Soviet football hard, and after just three games played in the season, CDKA Moscow, who had made up most of the USSR squad, was forced to withdraw from the league and later disbanded. Furthermore, Boris Arkadiev, who coached both USSR and CDKA, was stripped of his Merited Master of Sports of the USSR title. The 1966 FIFA World Cup was the tournament which the Soviet Union team reached their best result by finishing in fourth place. Soviet Union was in Group 4 with North Korea, Italy and Chile. In all three matches, the Soviet Union team managed to defeat their rivals. The Soviet team then defeated Hungary in the quarter-finals thanks to the effective performance of their star, Lev Yashin but their success was ended by two defeats on 25 and 28 July, against West Germany in the semi-finals and Portugal in the third place play off match, respectively. The 1966 squad was the second best scoring Soviet team in the World Cup history, with 10 goals. After being runners up at Euro 1972, the rest of the 1970s were bleak for the Soviets, who were disqualified from the 1974 World Cup as a result of refusal to play Chile in the aftermath of the 1973 Chilean coup d'état, and failed to qualify for the 1978 World Cup or the 1976 and 1980 European Championships. The 1982 World Cup was the Soviet Union's first major tournament appearance for a decade. The Soviet Union was in Group 6 with Brazil, Scotland and New Zealand. Goals by Socrates and Eder marked the defeat of the Soviet side against Brazil in the first group match (even though it was a very hard match for the Brazilians), and they were eventually eliminated in the second round by finishing the group in second place, when they defeated Belgium only 1–0 and drew against Poland with an 0–0 result. In 1984, the Soviets again failed to qualify for the European Championships, but succeeded in qualifying for the 1986 World Cup. Soviet Union were in Group C with Hungary, France and Canada. The Soviets used Irapuato, Guanajuato as their training ground in the World Cup. 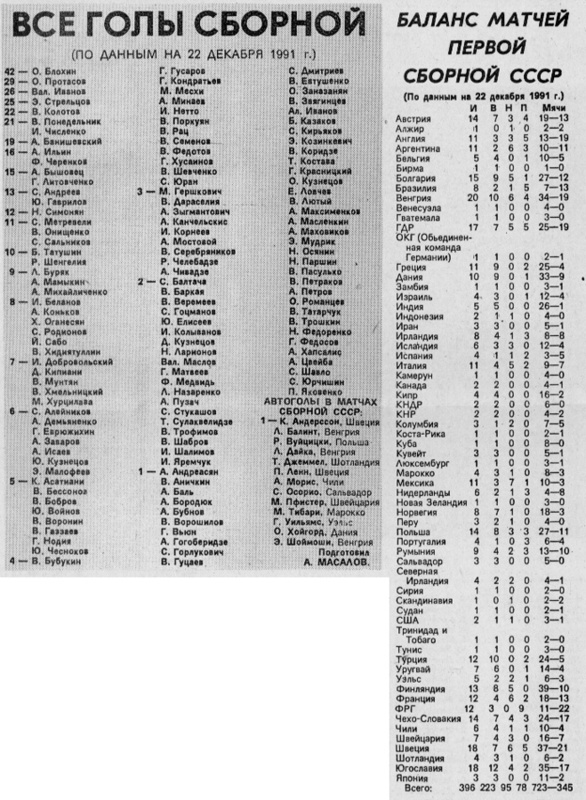 The Soviet team enjoyed a successful group stage by scoring nine goals and finishing the group in first place. Ultimately, however, they lost to Belgium 3-4 after extra time in the round of 16. Despite their poor performance in the cup, this team was the best scoring Soviet team in World Cup history, with 12 goals. After failing to qualify for three consecutive European Cups (1976, 1980, 1984), the Soviets managed to qualify for the 1988 competition, the last time the Soviet Union national football team took part in the European Football Championship. The finals were held in West Germany, with eight teams participating. Soviet Union finished Group B as leaders above the Netherlands and defeated Italy 2-0 in the semi-final. In the final against the Netherlands, another team from Group B, the Netherlands won the match with a clear score to be crowned European champions. The final major championship contested by the Soviet team was the 1990 FIFA World Cup, where they were drawn in Group B with Argentina, Romania and Cameroon. The only success for the Soviets came when they defeated group leaders Cameroon 4-0. The Soviets lost their other matches and failed to qualify from the group. The Soviet Union qualified for Euro 1992, but the breakup of the Soviet Union meant that their place was instead taken by the CIS national football team. After the tournament, the former Soviet Republics competed as separate independent nations, with FIFA allocating the Soviet team's record to Russia. In 1985–1989 the national team competed in the annual Nehru Cup (India). Although never used by either the Soviet Union national football team nor Soviet Union Olympic football team, Dinamo Stadium in Minsk was designated as the official stadium for the 1980 Summer Olympics. ^ "Soviet Union 11:1 India". eu-football.info. Retrieved 2016-03-23. ^ "Member Association - Russia". FIFA.com. ^ Hentilä, Seppo (1982). Suomen työläisurheilun historia I. Työväen Urheiluliitto 1919–1944. Hämeenlinna: Karisto. pp. 146–148. ISBN 951-23216-0-2. ^ Hentilä, Seppo (2014). Bewegung, Kultur und Alltag im Arbeitersport (in German). Helsinki: The Finnish Society for Labour History. p. 48. ISBN 978-952-59762-6-7. ^ "Soviet Union - International Results 1911-1935". RSSSF. Retrieved 13 January 2007. ^ "Yugoslavia National Team List of Results 1950-1959". RSSSF. Retrieved 13 January 2007. ^ "1958 - Qualifying competition". Planet World Cup. Retrieved 13 January 2007. ^ "History. About FUR. General information. FUR". en.rfs.ru. Archived from the original on 9 September 2016. ^ www.rusteam.permian.ru, Кашинцев Александр. "Литовченко Геннадий Владимирович. Сборная России по футболу". www.rusteam.permian.ru.